Hello everyone! Before I introduce you to this week Featured Cardmaker I’d like to remind you that there is a postal rate increase scheduled to take effect on January 22nd and encourage you to get your cards mailed in before then if you’d like to save a little money. Details about the increase can be found at the USPS page here. Now for some creative inspiration…. 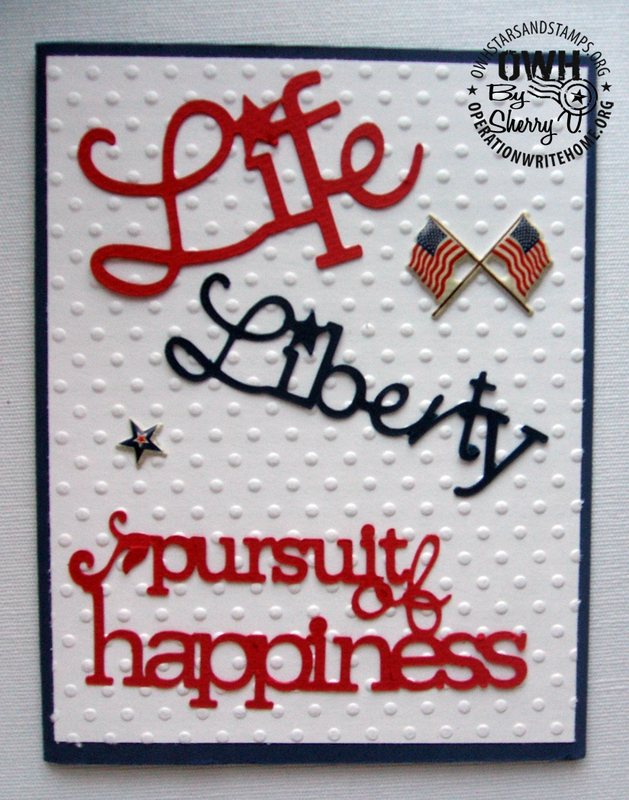 this week I’d like to introduce you all to Sherry from Ohio and to share a few of her cards with you. While Sherry doesn’t have a blog of her own she tells me she loves browsing others’ for new ideas. Be sure to say hello and leave your comments for her here at the end of this post. I started stamping with a coworker on my breaks and lunches 6 years ago now. I have been stamping for the entire time and I love it. Right now, I have a nice area in the basement. As soon as my daughter moves out, my craft room will be in her room, upstairs with much better natural light and a bit more space. I have all kinds of plans my craft room then. 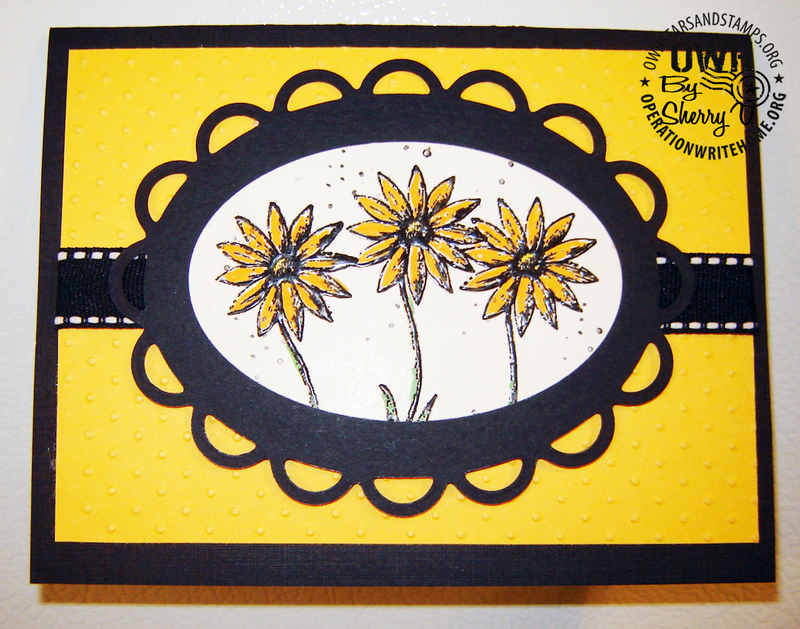 I use my Cuttlebug and Nestabilities a lot and I love Hero Arts, Penny Black and Gina K. stamps. 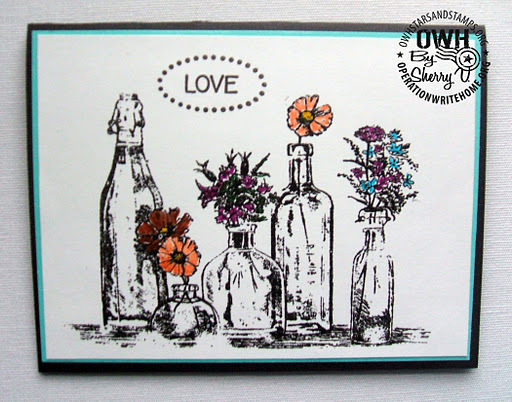 I also love Tim Holtz’s line of products. I like heat embossing. It is one of the first techniques I learned and I like the way it stands out on a card. I recently read a heart-warming post on Facebook from a soldier whose daughters are blind. They were able to feel the embossing on the cards as if it were Braille and since reading that, I’m using the technique even more often. I was on a website (I don’t remember which one) looking at stamps and someone commented that they had to have that stamp to use for their Operation Write Home cards. The rest is history. I have always been a very patriotic person. I have many relatives and friends that were or are still serving in the military and I have a few friends who sacrificed their lives fighting for our country. I cannot think of a better way to support our heroes than sharing what I love to do. Great set of cards! The hello card is gorgous! Thanks for sharing your talents! Sherry, these are beautiful cards. Especially like the flowers in the bottles and the valentines day. Your color combos are great. Thank You for sharing. I always admired your knack for stamping. I love your cards. Your colors always convey such warmth. Keep it up girl!! Your work is just awesome! Now I know a celebrity in card making!! Sherry, Each and every one of your cards is beautiful. I could not even pick a favorite. Anyone is lucky to receive anything that you create. Thank you for being our sample maker this week. This ia a very nice group of cards Sherry! I particularly like the effect of coloring only some portions of a black and white image in the first card and the watercolor effect in the Hello card is really striking too. Thanks for letting me share your OWH story with everyone this week! Sherry, every card shown is wonderful! I really like the first card. Probably because I like flowers in bottles more than in vases! 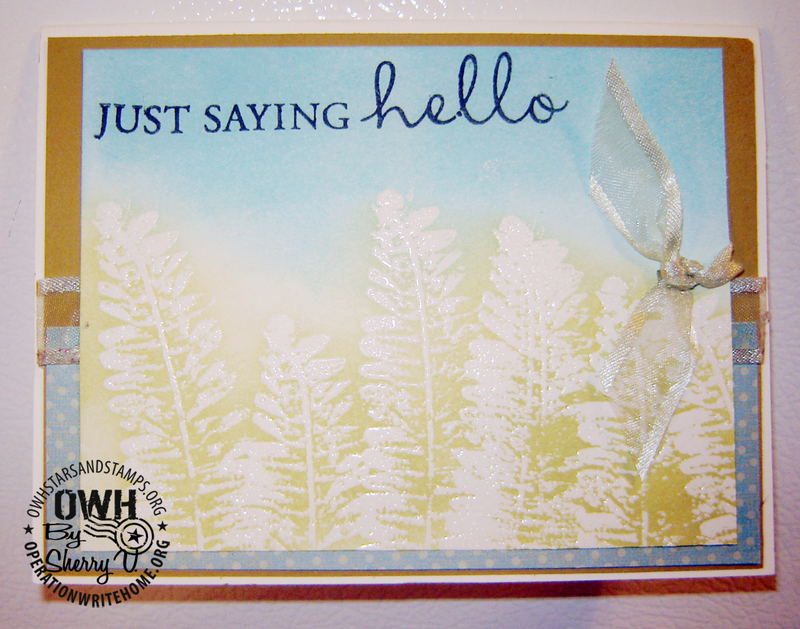 I also like the "saying hello" card with the ribbon coming up from the back – what a neat idea. Thanks for sharing your cards with us! Beautiful cards! Love the Valentine! 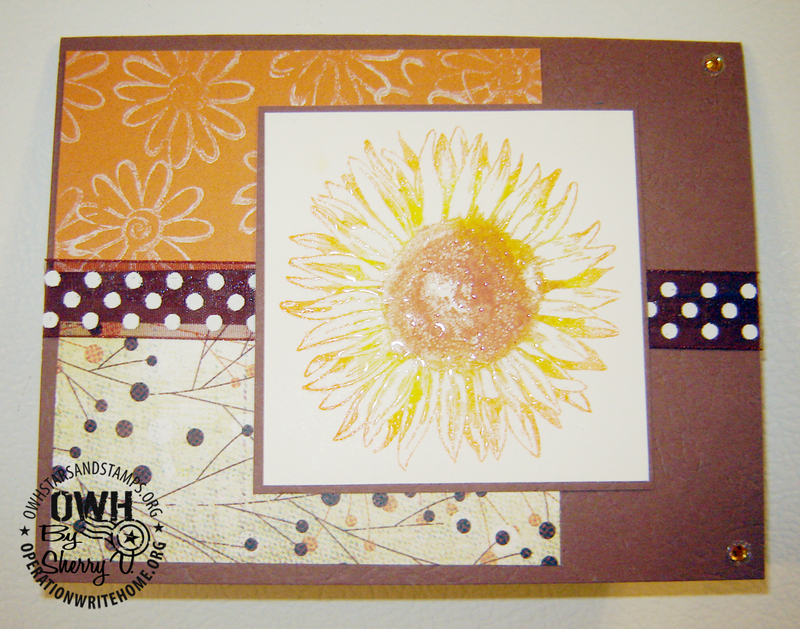 Pat K.
Gorgeous cards Sherry….but then I see first-hand all of the gorgeous work that you do. Love the Valentine especially!!! Sherry, all of your cards of gorgeous. You truly are talented!! Thanks for sharing!! Great cards, Sherry! As always!! So many great techniques! I love your comment about heat embossing. To know the soldier's daughters were able to feel it, so touching! Thank you for sharing that with us! Sherry.. I knew you had talent when I received my 1st card from you. These are beautiful. Thank you for sharing with me. I was stunned when you shared the soldier's story of his blind daughters being able to read embossed cards!! Who knew? I'll be sending more embossed cards to OWH in the future now that I know this! 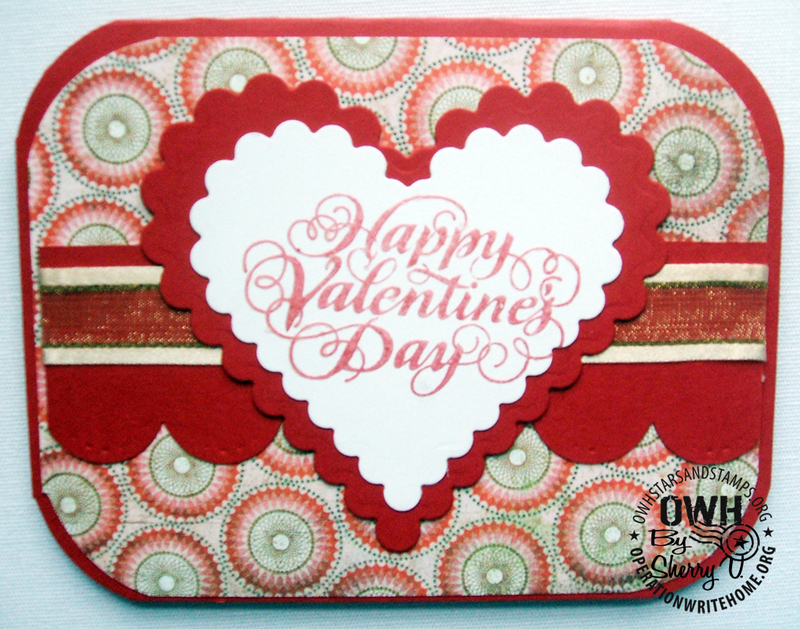 Your cards are all so pretty and it's nice to meet another OWH card maker! I just love your "saying hello" card with those pretty trees! Your cards are so beautiful! I don't do embossing as much as I should but your story about the little girl will make me think of that a lot more often. I love all the various designs you made and I know the soldiers will love them even more. Such a great talent you have! Ooooh, Sherry, I love that Valentine! Fantastic paper choices. Sherry,All your cards are wonderful. I really like the just saying hello one. Thank you everyone, what nice comments you have all submitted. It is an honor to be featured. Thank you for sharing these wonderful cards, Sherry. I really love the little pops of color in the flowers on the first Love card, and your "Hello" card is just stunning with the embossing and subtle color changes on the image. Beautiful, beautiful, beautiful! Beautiful cards, made by a beautiful lady. Very artistic, by someone with a very "artsy" air about themself. Every card is a winner in my book,…..even the ones you have sent me! Thanks for taking time to share with our men and women who are serving our country. God bless you.